Today’s contract interiors have evolved, but certain forms never go out of style. Dia embodies classic geometric interplay, an archetypal triangle pattern build from welded rod that is both highly decorative and functional as either a coffee or occasional table. 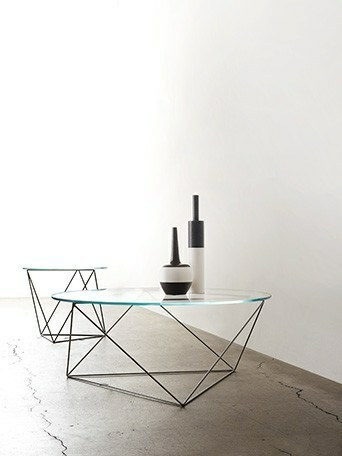 Price includes a wire frame coffee table with a Starphire Glass top and a standard powder paint finish. $1,808 Manufacturer: Stylex Lead Time: 6	- 8	weeks Size: 14.5" OH x 36" Dia.